And as the summer months go by, Bailey must choose whether to cling to a dreamy online fantasy in Alex or take a risk on an imperfect reality with Porter. 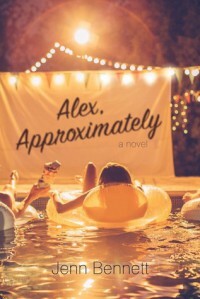 The choice is both simpler and more complicated than she realizes because Porter Roth is hiding a secret of his own: Porter is Alex…Approximately. I was worried, despite the multitude of glowing reviews that I would find this annoying and juvenile, but it was actually quite good. It might have felt like it was even going in that direction, early on. But it soon became a story of substance. After reading the blurb above, it comes off as being a story about IM's between two people, but that’s really only a small portion of the story. Overall, the story has a lot more to offer than that and it was a really sweet and worthwhile listening experience. Book Cover~ It's Okay…but it doesn't represent the story.